At the 2nd Kazimierz Łaski Lecture, Marc Lavoie provided a historic overview of the heterodox debate on what drives aggregate demand. A summary by wiiw Economist Vasily Astrov. The global economic crisis of 2008 highlighted the importance of aggregate demand for economic development. Once credit expansion ran out of steam, the economies of advanced countries have been persistently struggling with a shortage of effective demand, which has constrained growth. 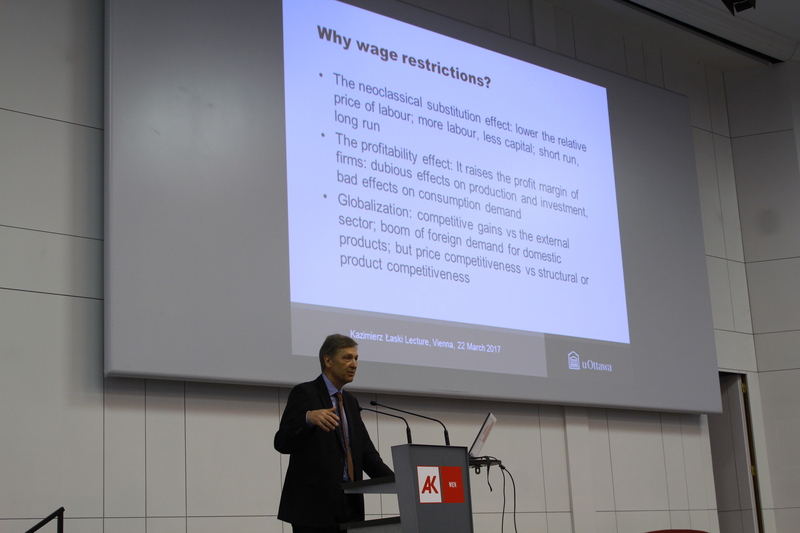 The lecture by Marc Lavoie provided a historic overview of the heterodox debate on what drives aggregate demand. According to the Keynesian view, it is essentially driven by wages, whereas according to the Marxian-Goodwinian view, it is rather driven by profits. The lecture showed that at a theoretical level, these two approaches do not necessarily contradict each other and can in fact be complementary. Empirical evidence is, however, mixed and does not provide unequivocal, ‘one-size-fits-all’, policy recommendations. Wages as a growth driver? It has been long recognised that a rising wage share has an ambiguous effect on the aggregate demand of a single country: while it tends to boost domestic demand, it often undermines international competitiveness and thus net exports. However, several econometric studies have found that a rising wage share, if it occurs in many countries simultaneously, tends to have a positive effect on aggregate demand (the presumed reason being that wage earners have a higher propensity to spend). This general observation, however, does not necessarily imply that a demand regime is always wage-driven, nor does it distinguish between the underlying transmission mechanisms at different stages of a business cycle. For instance, aggregate demand during the bottom part of a cycle has been regularly found to be profit-led. One reason for that is the existence of the so-called ‘overhead labour’, i.e. administrative, supervisory and maintenance employees who are not laid off even during bad times, which adversely affects firm profitability. As the utilisation of these excess capacities improves in line with the cyclical upswing, firm profitability improves as well and the profit share goes up; this enables firms to invest, thereby adding to aggregate demand. At the later stages of a business cycle, however, as the bargaining position of labour improves and the wage share goes up, firm profitability starts to suffer, and the demand regime switches from being profit-led to being wage-led. Do economic crises result from a falling profit share? In a cyclical downturn, one typically observes the combination of a falling profit share (which is often attributed to excessive labour costs at the peak of the cycle) and a decline in corporate investments. However, the conclusion that the former causes the latter may be incorrect. Instead, economic crises have been found to be triggered by a turnaround in household willingness to buy debt-financed durable consumer goods and take mortgages. This suppresses aggregate demand which, in turn, makes firms revise their investment plans. In this case, the falling profit share is a mere consequence, rather than the cause, of the economic downturn. Therefore, crises have typically little to do with shifts in the wage and profit share, but are rather caused by other factors. One such factor is, for instance, monetary policy tightening by the central bank in the face of inflationary pressures, which curbs consumer demand for credit. Wage hikes can be arguably an effective instrument to raise aggregate demand, but not necessarily employment. The reason for that is the positive effect of higher wages and aggregate demand on labour productivity. If this effect is strong enough to offset the positive impact of higher aggregate demand on employment, as many econometric studies have found, the latter may fall as a result. Therefore, wage hikes alone may not be sufficient to ensure full employment, calling for other tools such as expansionary fiscal policy. 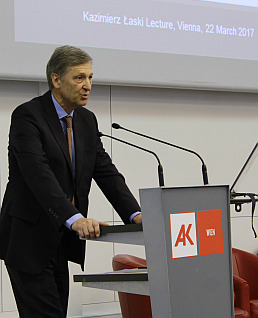 One strong advocate of fiscal policy measures to reach full employment was, for instance, Kazimierz Łaski, former wiiw director of research. Prof. Marc Lavoie holds a Senior Research Chair at the University Sorbonne Paris Cité, University of Paris 13 and is emeritus professor at the University of Ottawa, where he was teaching for 37 years. He has published many articles on monetary theory and policy, growth theory and macroeconomics in general. In 2014 he has published a book, ‘Post-Keynesian Economics: New Foundations’, providing a synthesis of post-Keynesian approaches. He also published an ‘Introduction to Post-Keynesian Economics (2006), ‘Foundations of Post-Keynesian Economic Analysis (1992), as well as ‘Monetary Economics: An Integrated Approach to Money, Income, Production and Wealth’ (2007) with Wynne Godley.